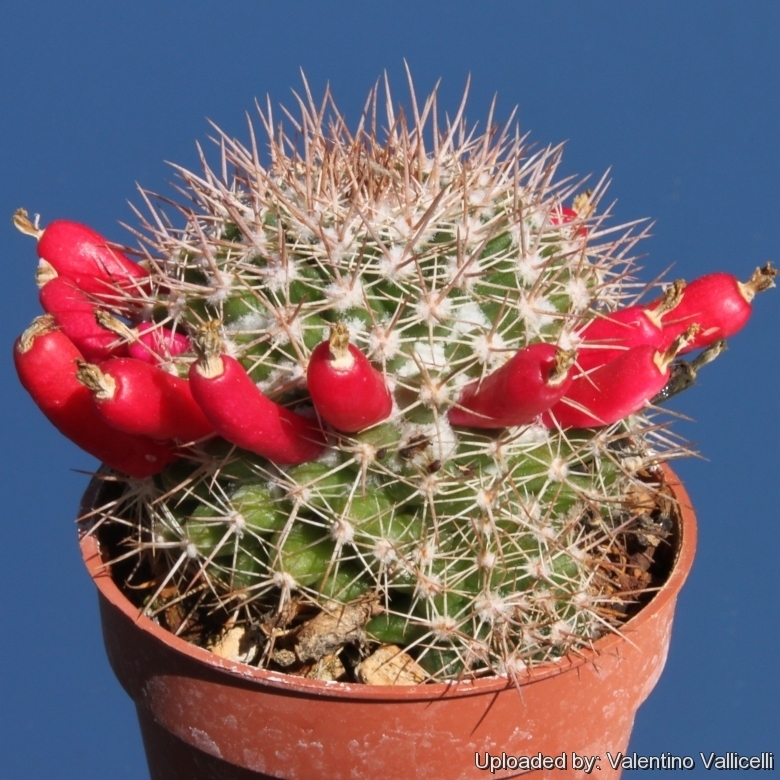 Along with Mammillaria colombiana it is one of only two South American species. The fruit are edible. 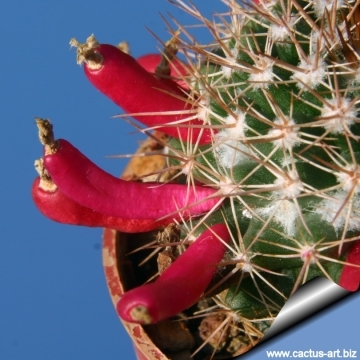 Origin and Habitat: Mammillaria mammillaris is found in the coast of Venezuela and and the adjacent islands Antigua and Barbuda; Aruba; Bonaire, Sint Eustatius and Saba (Saba, Sint Eustatius); Curaçao; Dominica; Grenada; Guadeloupe; Martinique; Montserrat; Saint Kitts and Nevis; Saint Lucia; Saint Martin (French part); Saint Vincent and the Grenadines; Sint Maarten (Dutch part); Trinidad and Tobago. It is a common species with a widespread distribution and abundant populations especially in Venezuela. Habitat: It is found in costal and mountainous regions at medium altitude (up to 1.500 m) in clearings in spiny scrublands and thorny forests and do not tolerate frost. It also occurs on offshore rocky islands. Part of its habitat is being converted for agricultural activities such as crop production. It is unknown whether collecting from the wild (for ornamental plants) is affecting the population status since this species is relatively common. Description: Fairly slow growing and usually solitary or forming clumps. Stem: Globose to short cylindrical, light to dark green, shiny, 8 to 20 cm in diameter. With latex. Tubercles: Tubercules in spiralled rows, ovoidal to conical up to 1 cm tall, parastichy number 8-13, there is no or few wool in the axil. Areoles: Rounded with abundant white wool especially the younger one.. Radial spines: Spreading, 6 - 16, yellowish-white to reddish brown, becoming grey with age, 5 - 8 mm long. Central spines: 3 - 5, reddish brown, with dark tips, later grey, 7 - 8 mm long, uppermost longest. *Flowers: Diurnal, very small, inconspicuous, almost concealed among the tubercles, funnelform, white, greenish, yellowish or creamy white, 5 - 12 mm long. Fruits: Club shaped, scarlet-red, 10 - 20 mm long, edible. Notes: Mammillaria mammillaris is the type species of the genus Mammillaria, which itself is the type genus of the tribe Cactaceae of the subfamily Cactoideae of the Cactaceae. 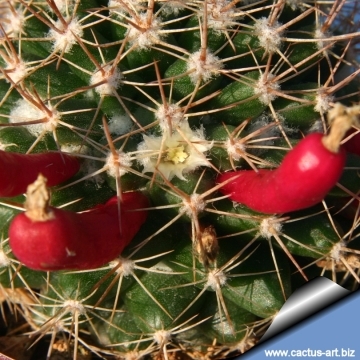 In fact all cacti should be named "Mammilariaceae", but the name "Cactaceae" has been conserved (Nomen conservandum). 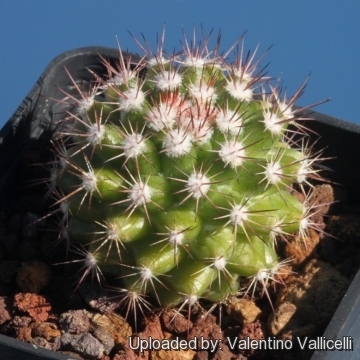 The generic name Mammillaria is also a nomen conservandum, on one hand against Linné's genus cactus, on the other hand, against an earlier homonym, the algae species Mammillaria. Linneé's genus "Cactus" was soon given up, because it included too many species unrelated to each other. 4) Nassar, J. 2013. Mammillaria mammillaris. The IUCN Red List of Threatened Species. Version 2015.2. <www.iucnredlist.org>. Downloaded on 11 July 2015. 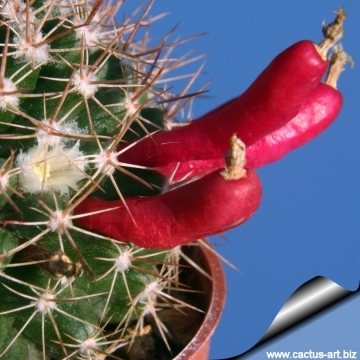 Cultivation and Propagation: It is a relatively slow growing species. Water regularly in summer, but do not overwater (Rot prone) Use pot with good drainage and a very porous potting media, keep dry in winter. Feed with a high potassium fertilizer in summer. Avoid any frost (Said to be one of the least cold tolerant members of the genus). Reputedly sensitive to low temperatures, but less so if kept on the dry side prior to, and during, cold weather. Seems to appreciate somewhat weaker light than most mammillarias, and it will take on a reddish colour in bright light, which encourages flowering and heavy wool and spine production.. Outside full sun or afternoon shade inside it needs bright light, and some direct sun. 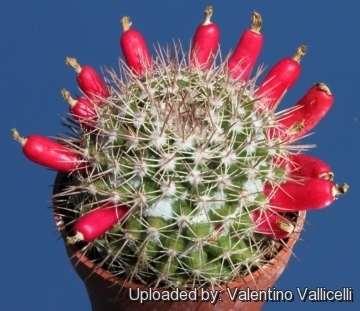 Be careful when you repot Mammillaria mammillaris. Its spine is sharp and hard. 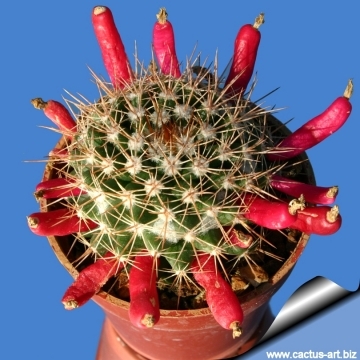 You should use gloves or wrap the cactus with thick newspaper. They may make it easier. Propagation: Direct sow after last frost or division of larger clups.